The work has since been completed as a video clip at the BBC titled New access to Lord of the Isles shows. 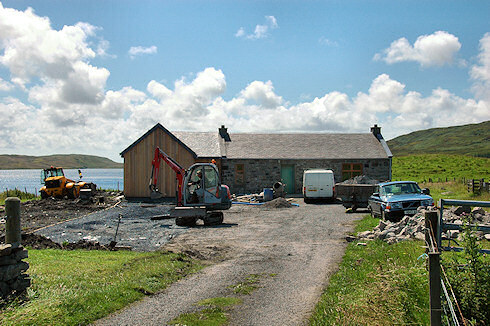 It provides an overview about Finlaggan and provides a few impressions of the refurbished and expanded visitor centre. The extended visitor centre will officially be opened tomorrow, Saturday, 16/May/2009 at 14:30 with archaeologist Dr David Caldwell and historian Dr Fiona Watson in attendance. Later there will be a celebration ceilidh at Ballygrant Hall (Saturday, 16/May, 19:30). That's all I have for this evening. As usual I'll post the larger version on the Islay Pictures photoblog tomorrow morning. Have a great weekend!